Achilles Radial Drifters Dominated Drift War IV Podium! 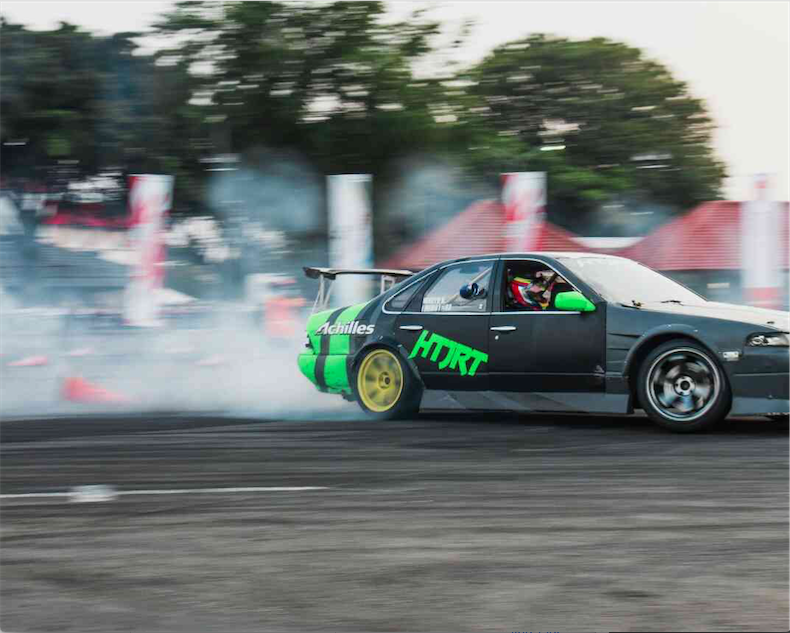 Jakarta, April 18th 2016 – Indonesia International Motor Show (IIMS) has been successfully been organized, as well as The Drift War IV 2016 competition which lasted for two days from 15th to 16th of April 2016 in JIEXPO Kemayoran last week. The competition that has been held for 4 years in a row is clearly a prestigious event amidst Indonesian drifters. This year, Achilles Radial has participated with several teams which are Achilles Radial Team, Achilles Art Shine, Haji Tjandra Racing Team (HTJRT), Pertamax Drift Team, and BSI Achilles. HTJRT comes with the most drifters with 6 drifters. 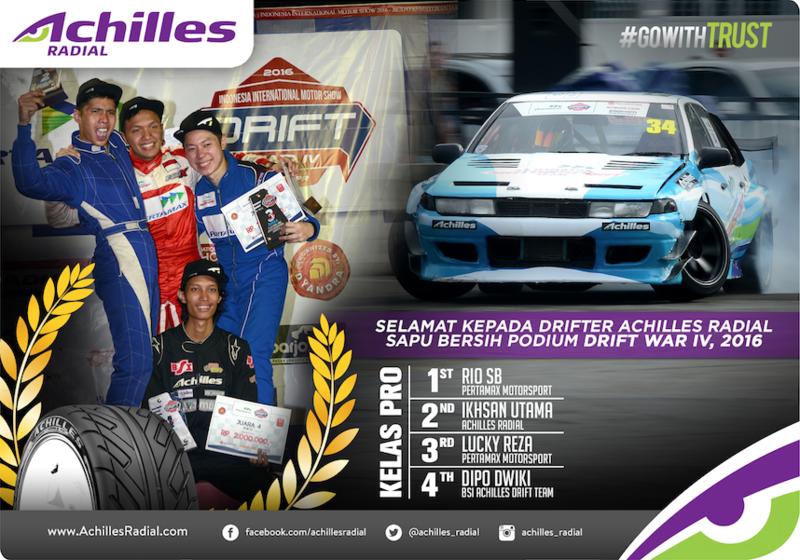 Drifters Amandio, Ikhsan Utama, M. Irdhan, Rengga M., and Evan Pratama represented for Achilles Radial Team. Whereas Pertamax Drit Team was represented by Rio SB and Lucky Reza. Not particularly the same as last year’s, one of Indonesia’s professional drifter, Rio SB, competed using Achilles Radial. PT Multistrada Arah Sarana, Tbk along with Achilles Radial brand has a huge commitment in reviving and maintain drifting in the highest level in Indonesia. In this year’s Drift War, Achilles Radial presents 3 pattern tires, which are 123S, ATR Sport and ATR Sport 2. These three tires are high performance and competition type tires which have been approved in the Drifting world, both in national and international scale. “Achilles will consistently give support and participate in every Drifting competition both locally and internationally as we have always did for recent events such as FD, D1GP Japan, King of Nations in Asia and other international events. Even so, Achilles has also organized Drifting competition series, such as AMF 2015 which was held last year and this year’s AMF 2016 will be held once again in Indonesia’s big cities which are Malang, Yogyakarta and Pekanbaru. This event will start in May until the end of year,” said M. Zein Saleh as the Senior Marketing Manager of PT Multistrada Arana Sarana, Tbk. These four drifters who have successfully made their way up to the podium were competing using Achilles Radial tires. Congratulations to all drifters who have swept the podium clean from the 1st to 4th place in Pertamax Drift War IV 2016 event in IIMS Kemayoran on April 16th 2016.